Set of 12 Colors, in 20 ml Tubes — Colors include 20 ml tubes of Ivory Black, Crimson Lake, Vermilion Hue, Yellow Ochre, Permanent Yellow Light, Permanent Green Pale, Viridian Hue, Cobalt Blue Hue, Ultramarine Deep, Burnt Sienna, Burnt Umber, and a 50 ml tube of Permanent White SF. 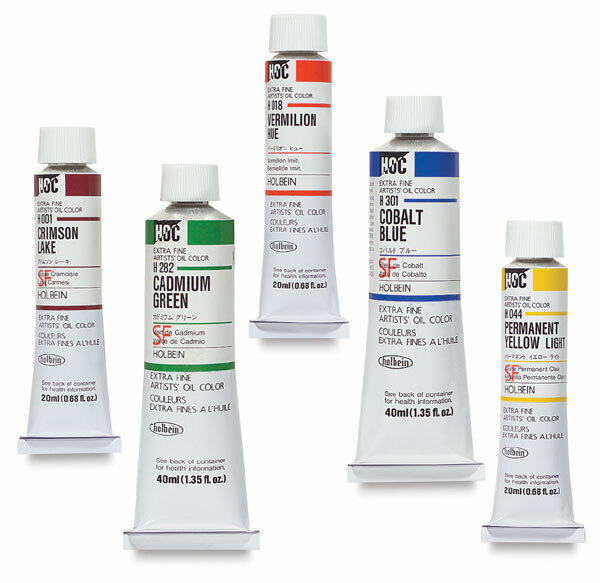 Set of 24 Colors, in 10 ml Tubes — Colors include 10 ml tubes of Burnt Sienna, Burnt Umber, Cerulean Blue, Chinese Red, Cobalt Blue Deep, Cobalt Violet Light Hue, Crimson Lake, Emerald Green Nova, Ivory Black, Jaune Brilliant 3, Lemon Yellow, Light Red, Permanent Orange, Permanent Green Deep, Permanent Green Pale, Permanent Yellow Deep, Permanent Yellow Light, Prussian Blue, Terre Verte, Ultramarine Deep, Vermilion Hue, Viridian, Yellow Ochre, and Permanent White SF. Set of 18 Colors, in 10 ml Tubes — Colors include 10 ml tubes of Burnt Sienna, Burnt Umber, Chinese Red, Cobalt Blue Deep, Compose Blue, Ivory Black, Jaune Brilliant 3, Lemon Yellow, Light Red, Permanent Green Deep, Permanent Green Pale, Permanent Yellow Deep, Rose Madder, Ultramarine Light, Vermilion Hue, Viridian, Yellow Ochre, and Permanent White SF. Set of 12 Colors, in 10 ml Tubes — Colors include 10 ml tubes of Burnt Sienna, Burnt Umber, Cobalt Blue Hue, Crimson Lake, Ivory Black, Permanent Green Pale, Permanent Yellow Light, Ultramarine Deep, Vermilion Hue, Viridian Hue, Yellow Ochre, and Permanent White SF. Transparent Oil Colors — These colors are pre-thinned for glazing, handcoloring photographs, and decorative painting on many surfaces, including glass. Foundation Oil Colors — These colors contain a high percentage of opaque pigment suspended in linseed oil. They provide a barrier between the painting and the primed surface. They are perfect for underpainting and texturizing the surface prior to painting.